Well, a few thanksgiving pounds later and today I just really needed something wholesome. And healthy. And warm. And creamy. And savory! 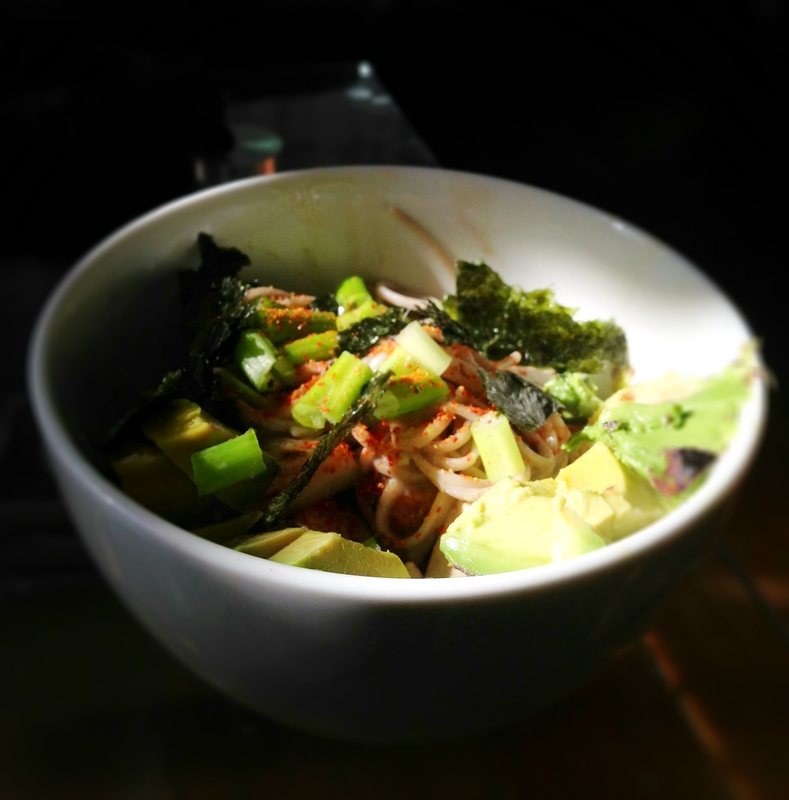 This soba is kind of like my scrumptious soba salad, but heartier and for colder weather. The buckwheat noodles are perfect for a post-thanksgiving meal, but the miso-tahini dressing and avocado give this dish the creamy umame that you still crave after 3 days of gluttony. This warm bowl of earthy heartiness makes me feel like I might be doing something good for my life, after all. It’s perfect on a crisp cold day when you just need a little something to warm (and fill!) you up. I used left over brussel sprouts and some cauliflower, but you could use any veggies you have. Broccoli and carrots would be great too! I was starving and didn’t take any pictures of the process, so this is a streamlined post. Let’s get to it! Put a large pot of water on to boil. Cook Soba noodles according to directions, then drain and rinse with cold water. Meanwhile, chop veggies and tofu. Heat 1 tbsp olive oil in non-stick pan until hot. Toss in garlic and let cook for 1 minute. Add mushrooms, cauliflower, tofu and cook on high heat, stirring occasionally. Let the tofu and cauliflower get all brown and toasty! Add brussel sprouts and continue cooking for a few minutes. Add cooked soba noodles and sesame seeds and remove from heat. Stir to combine with veggies. Whisk miso, tahini and dressing in a bowl until smooth. Mix into noodles until everything is covered. 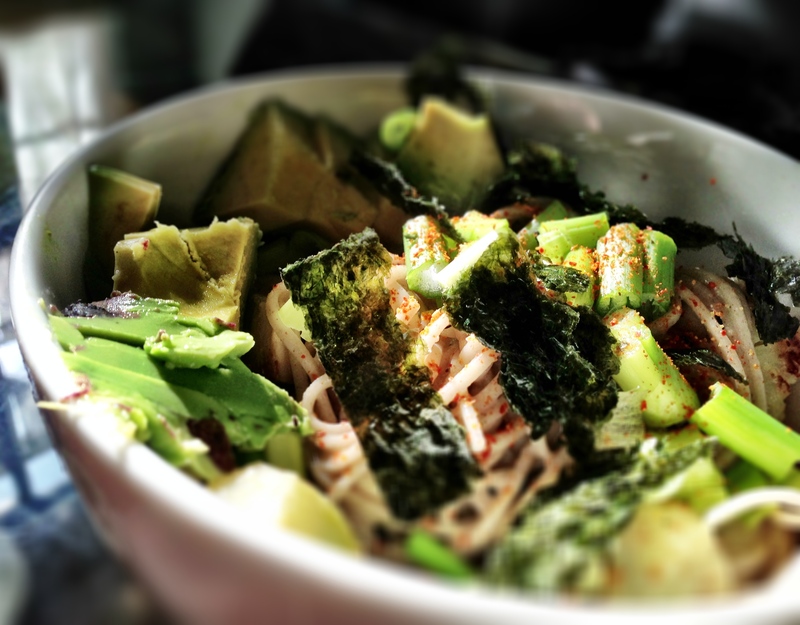 Serve in a bowl, topped with green onions, avocado and shredded seaweed! I also used some Japanese chili powder. If you don’t have any, you can use red pepper flakes or Sriracha.